Registration for the conference will remain open until June 1. Click here for information on discounted hotel rates. 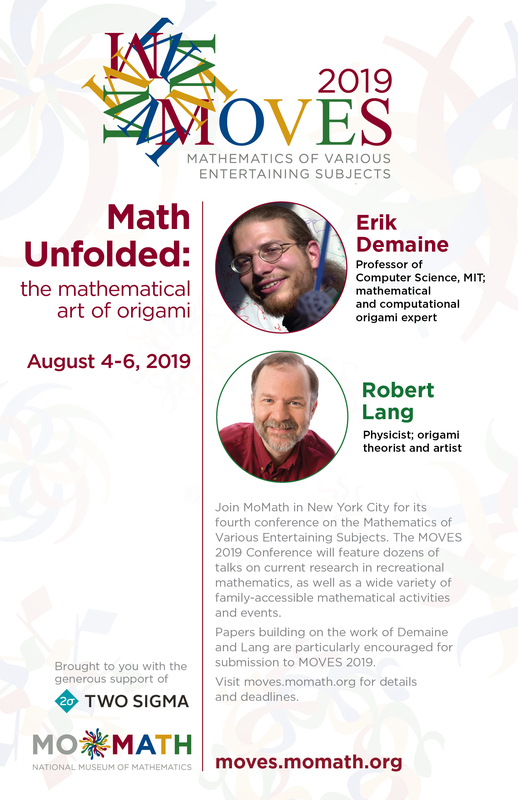 Limited conference attendee: Includes all mathematical activities, Sunday night dessert reception at MoMath, free admission to MoMath throughout the conference, and Monday night entertainment. Children age 6 through high school students: Includes all mathematical activities, Sunday night dessert reception at MoMath, free admission to MoMath throughout the conference, and Monday night entertainment. Children under 6: Includes Sunday night dessert reception at MoMath and free admission to MoMath throughout the conference. *(Conference bags are not guaranteed for late registrants (those who register after July 30, 2019). Take a look at MOVES 2017, MOVES 2015, and MOVES 2013. You can also purchase the MOVES Conference Proceedings books here: The Mathematics of Various Entertaining Subjects Volume 1 and The Mathematics of Various Entertaining Subjects Volume 2. Thanks to all the donors, supporters, presenters, and attendees who helped make MOVES a success!